This is one of those deals in which the back of the card is more important than the front. It’s from Wiley Oakley, the “Roamin’ Man of the Mountains”, a master tracker and woodsman. 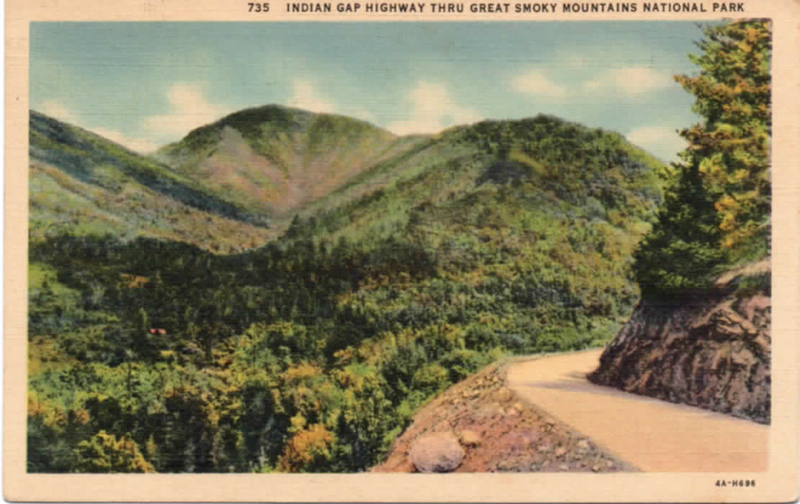 His knowledge of the area around the Great Smoky Mountains National Park was legendary. I can’t really make out the date on the postmark. At first, I thought it was “1931”. Now, the Curt Teich published card carries the alphanumeric code: 4A-H696. This, I think, puts the card issuance as 1934 or so, which is when the Park officially came into existence. I think the postmark wasn’t fully imprinted and the line I thought was a “1” is really just the left part of an incomplete number. 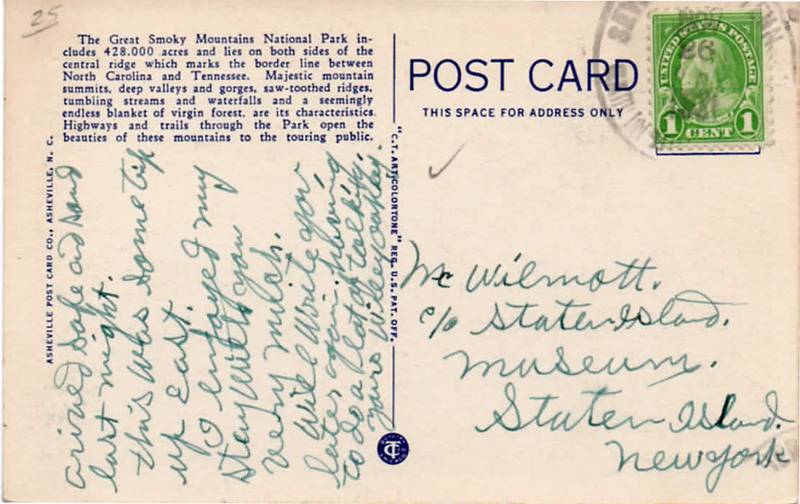 I can’t find any “Wilmott” associated with the Staten Island Museum (still in business). 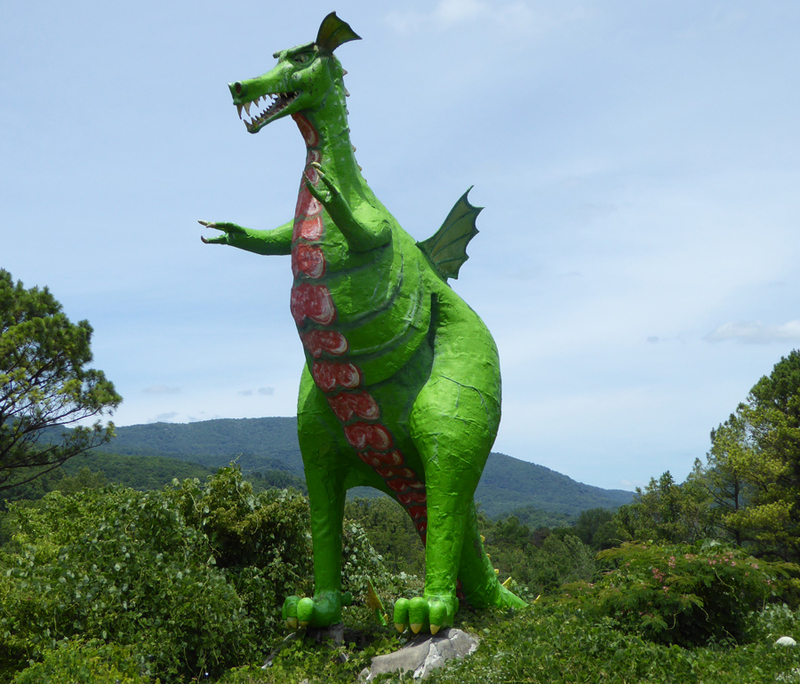 The Caryville TN dragon, the last reminder of the Monster Fireworks operation that once was located here (on Hwy 116). 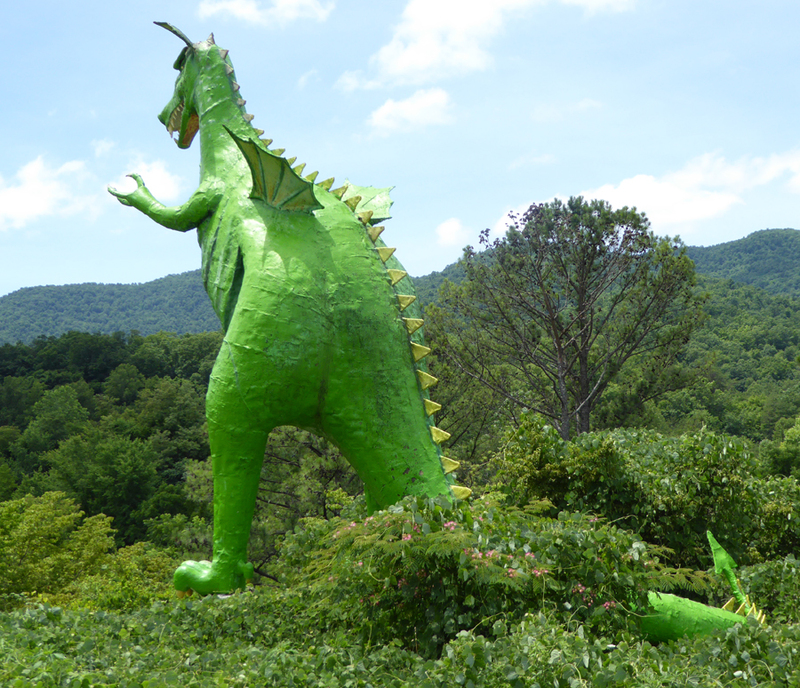 The dragon overlooks I-75 and once had red lights for eyes. Then, there was a tragedy. The story is here. A Dollar General store now sits where Monster Fireworks used to be. 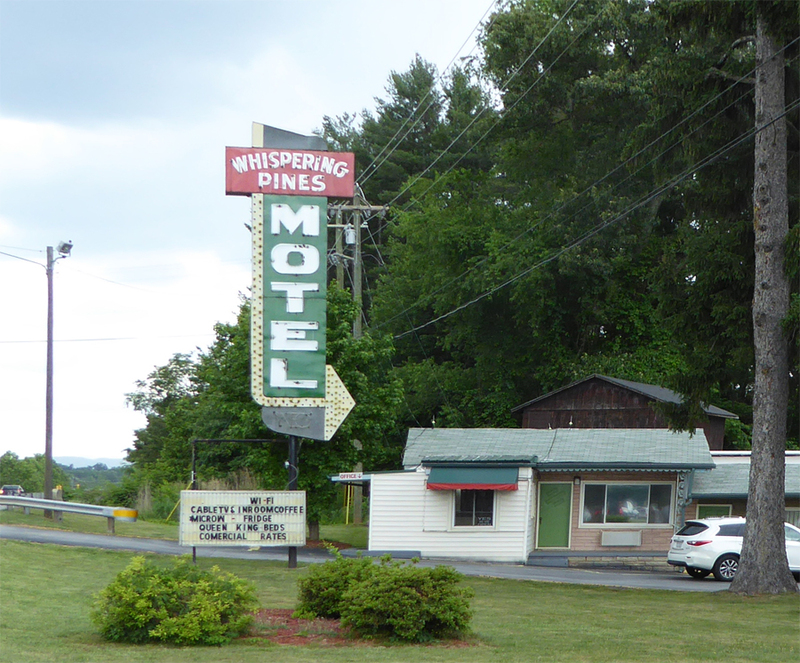 According to anecdotal sources, the dragon dates from the early 80s. I recognized the number and ignored it. The next day. At work. Ring. She denied having called me. Then, I blocked the number. I thought I could hear faint laughter coming from somewhere. 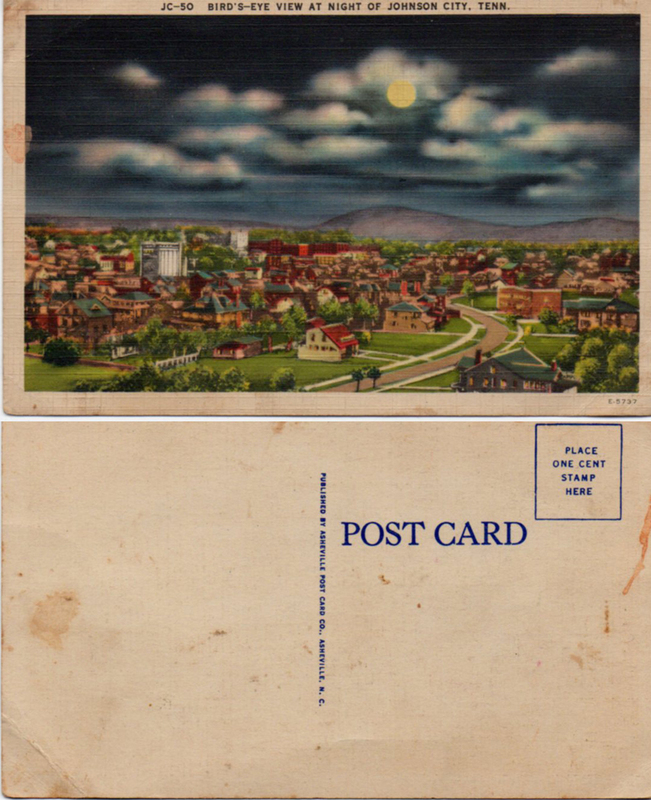 First, this is an Asheville Post Card Company issue, probably from the 50s. Don’t ever buy a card in this condition unless you need a placeholder until one in better condition comes along. I actually have ones in better condition, but this one was nearby when I needed something to post. I’d guess the original photo (it was in black-and-white…the color was added during the printing process) was taken somewhere around Top o’ the Town (I welcome other opinions). The white building on the left appears to be the General Mills pile that currently haunts the downtown.